Nizam  was the title of the native sovereigns of Hyderabad State, India, since 1719. They belonged to the Asaf Jah dynasty. 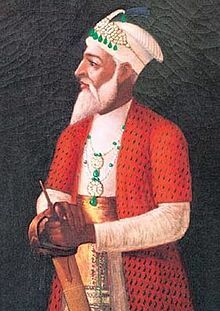 The dynasty was founded by Mir Qamar-ud-Din Siddiqi, a viceroy of the Deccan under the Mughal emperors from 1713 to 1721. After Aurangzeb's death in 1707, the Mughal Empire fell apart and the viceroy in Hyderabad said he was independent. From 1798 Hyderabad was one of the princely states of British India, but it kept local control. Seven Nizams ruled Hyderabad for two centuries until Indian independence in 1947. The Asaf Jahi rulers used money to support free Education, literature, architecture, art, culture and cuisine. The Nizams ruled the state until September 1948 after independence from the British. Nizām-ul-mulk was a title first used in Urdu around 1600. It comes from the Arabic word, nizām (نظام), meaning order, arrangement. The Nizam was also called Ala Hadrat, Ala Hazrat, or Nizam Sarkar. The first Nizam ruled in place of the Mughal emperors. After Aurangzeb died, the Mughal empire collapsed. So, the Nizams created an independent kingdom (Hyderabad). When the British got power over India, the Nizams continued to rule Kingdom of Hyderabad after coming into an understanding with the British. The Nizams had power in Hyderabad State until 17 September 1948. Hyderabad then became part of the new Indian Union. The Asaf Jah dynasty had only seven rulers. However, for 13 years after the rule of the first Nizam, three of his sons (Nasir Jung, Muzafar Jung and Salabath Jung) ruled. They were not officially recognized as rulers. A legend about the first Nizam says that on one of his hunting trips he was offered some kulchas (an Indian bread) by a holy man. He asked the Nizam to eat as many as he could. The Nizam ate seven kulchas and the holy man predicted that seven generations of his family would rule the state. By tradition, no Nizam has ever left India, even if there was good a reason. The Nizams commissioned engineering projects such as large reservoirs like Osman Sagar and Himayat Sagar. Survey work on the Nagarjuna Sagar Dam was also initiated during this time. Other landmarks like the Andhra Pradesh High Court, Jubilee Hall, Asafia library, The Assembly building, the Osmania Arts College and the Osmania Medical College are some of their important buildings. The Asaf Jahis also built many palaces. The Nizams liked the European style of architecture and created a fusion of European traditions with Hindu and Islamic forms and images. After the British left India in 1947, the princely state of Hyderabad did not join either of the new dominions of India or Pakistan. But later he decided to merge with pakistan. Sardar Patel sent representations to the Nizam to join India as Hyderabad's majority citizens wanted to join India, but the Nizam refused. The Indian army entered Hyderabad from four sides defeated Hyderabad Nizams army and the independent razakaars. The Nizam's rule ended on 17 September 1948. His soldiers surrendered to Indian govt. All Nizams are buried in the royal graves at the Makkah Masjid near Charminar in Hyderabad. Only the last Nizam, Mir Osman Ali Khan is buried in a different place. His mausoleum is in the Judi Mosque facing King Kothi Palace. ↑ Mahmood Bin, Muhammad (1999). A policeman ponders: memories and melodies of a varied life. A.P.H.Publishing Corporation. p. 19. ISBN 978-81-7648-026-0. ↑ Rann Singh, Mann (1996). Tribes of India:ongoing challenges. MD Publication Pvt Ltd. p. 310. ISBN 978-81-7533-007-8. Regani, Sarojini (1988) [First published 1963]. Nizam-British Relations, 1724-1857. New Delhi: Concept Publishing Company. ISBN 978-81-7022-195-1. Hastings, Fraser (1865). Our Faithful Ally, the Nizam. London: Smith, Elder & Co.
Briggs, Henry George (1861). The Nizam: His History and Relations With the British Government, Volume 1. London: B. Quaritch. Lynton, Harriet Ronken; Rajan, Mohini (1974). The Days of the Beloved. University of California Press. ISBN 978-0-520-02442-7. The Pied Piper of Hamelin, by Robert Browning: "I eased in Asia the Nizam Of a monstrous brood of vampyre-bats"
Wikimedia Commons has media related to Nizams of Hyderabad. This page was last changed on 16 April 2019, at 14:17.